Due to Hurricane Sandy I was unable to post yesterday, but we are back online today with no damage! I have to admit I am sucker for chocolate covered pretzels. There is just something about the salty pretzel and creamy chocolate mixed together that just makes me smile. 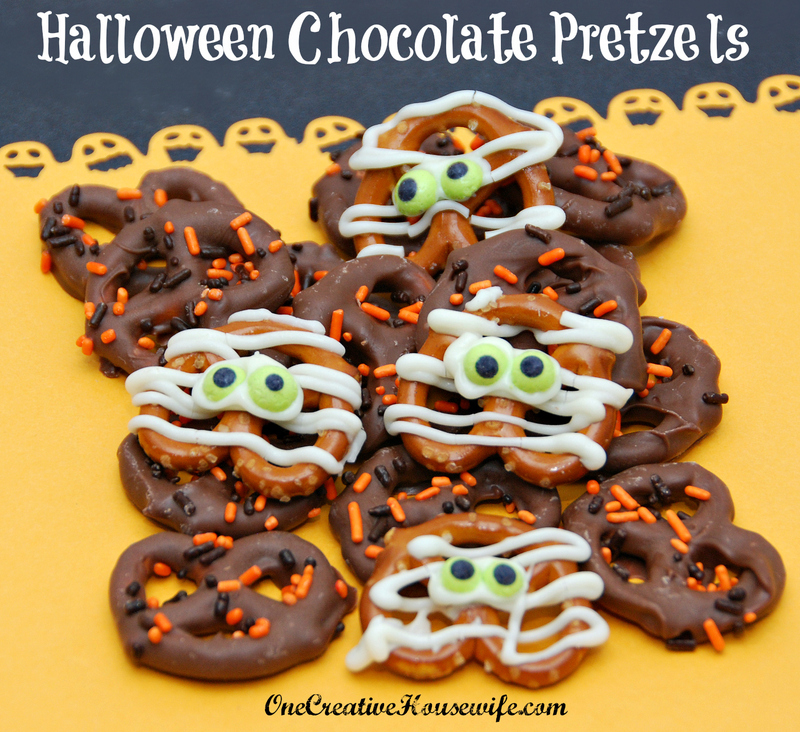 I made these little pretzel treats for my kid's school friends. 1. Cover baking sheet with wax paper. 3. Add 1 Tablespoon vegetable oil per bag of chocolate melts, and stir to combine. 4. Once your chocolate is melted, dip your pretzels into it 1 at a time. 5. Shake off any excess chocolate. 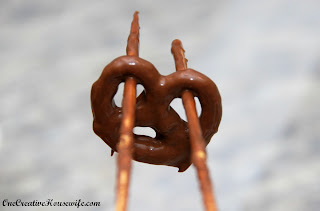 I used wooden skewers to hold the pretzels, and tapped them against the bowl, to get the excess chocolate off. 6. 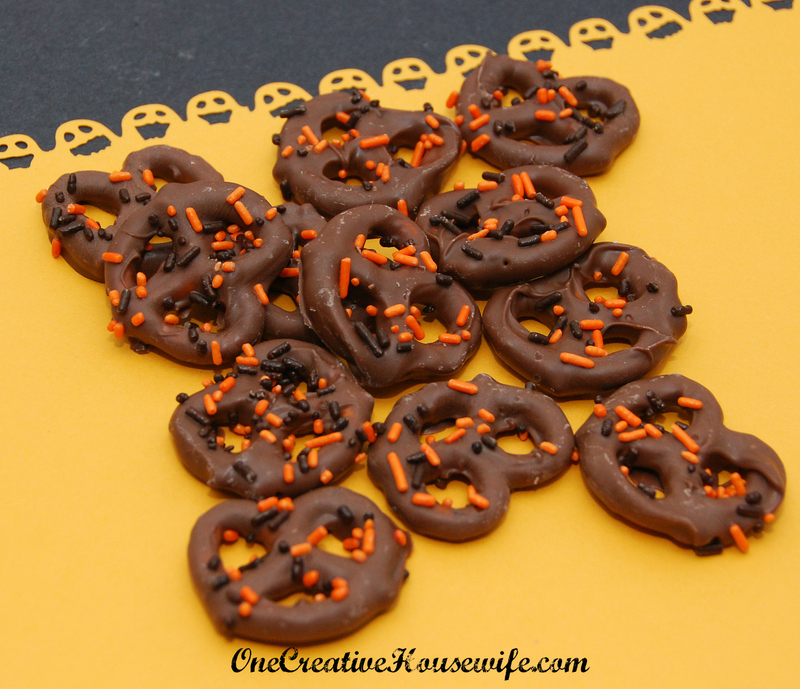 Place chocolate covered pretzels on wax paper and sprinkle with sprinkles. 7. Allow to dry completely, and store in an airtight container. 2. 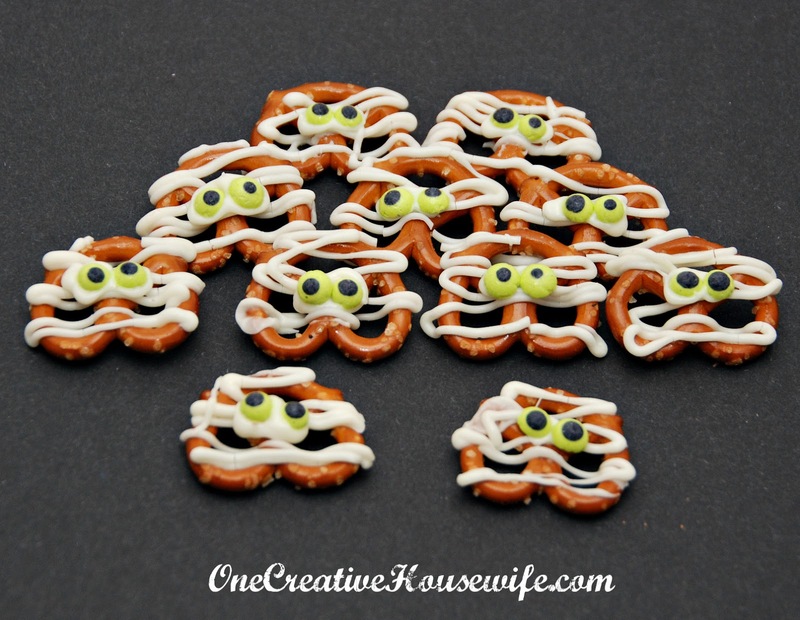 Line up your pretzels on the wax paper. 3. Melt half bag of your chocolate melts at a time according to package directions. I melted mine in a microwave safe bowl in 30 second intervals. 4. Add 1 Tablespoon vegetable oil per bag of white chocolate melts, and stir to combine. 5. Once your chocolate is melted, put the chocolate in a squeeze bottle*. 6. 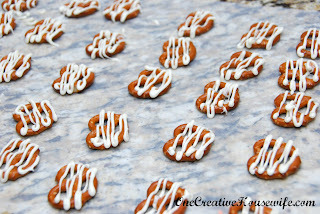 Using the squeeze bottle* drizzle the white chocolate over the pretzels on the wax paper. 7. Allow chocolate to dry. 8. Squeeze a little white chocolate where you want to apply the eyes. 9. 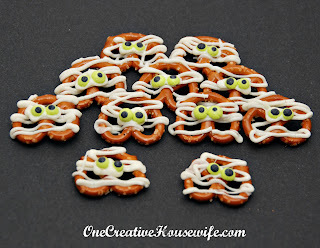 Add the candy eyeballs. 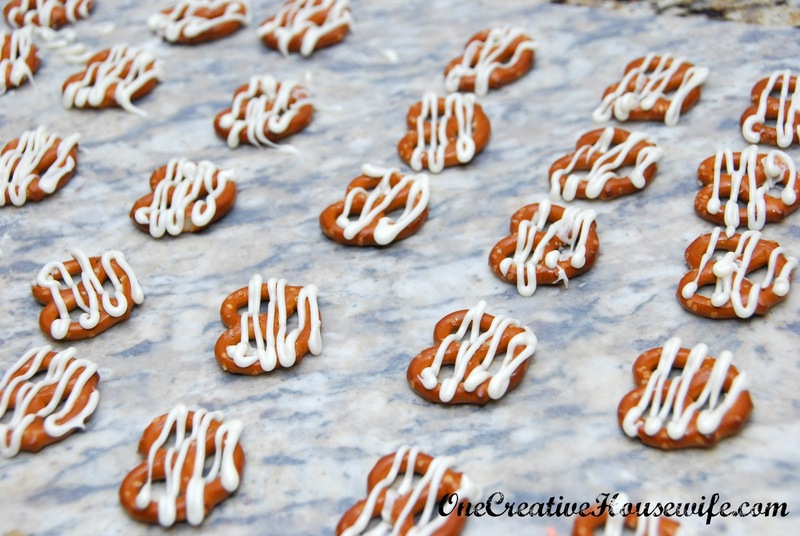 *Note - You could drizzle the white chocolate and apply the eyeballs at the same time, but I noticed that I messed the chocolate up less if I did it in two separate steps. I made 2 batched of each and got almost 1,000 chocolate covered pretzels. I placed 5 of each into little bags with candy corns on them, and made labels for the bags using the candy corn label template from Avery. 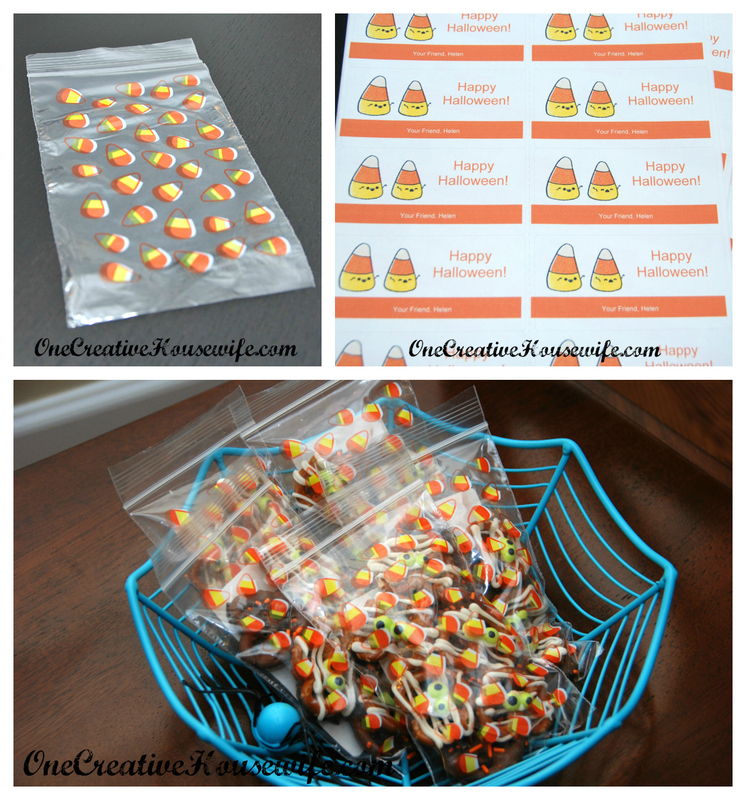 In hindsight I wish I had used clear bags instead so you could see the pretzels better; but I figured a bunch of 3 and 5-year-olds wouldn't care, and I was not about to label all the bags again. Thanks! And Thanks for stopping by!